New countertops can really make a huge difference in your home. Countertops that are old and outdated can age your home and make it seem out of style. To keep up with current trends and to make your home up to date and classy, you should consider having granite countertops installed. Granite countertops look beautiful and can really give your home the “wow” factor you are looking for. There are many other benefits to granite countertops besides the fact that they look great. Granite is all natural and comes directly from the earth. It is mined, cut into slabs and polished. It is a very economical choice and can really bring something extra into your home. Granite comes in a variety of patterns and colors and no two slabs are exactly the same. This will ensure that your countertops are unique and different from everyone else’s. Granite countertops are a great choice because they can work anywhere in your home. They are very water resistant and work well in the kitchen and the bathroom. They are easy to clean — just a little soap and water will do the trick, but they can also be sanitized. This makes granite a great surface to work on no matter what kind of project you are doing. 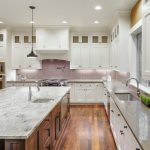 If you are interested in having brand new granite countertops installed in your home, contact us today at The Granite Guy. We can help you find the perfect granite for your home and we will have it professionally installed in no time. We also use a special 15-year sealer on all of our countertops, which will make your new countertops virtually maintenance free. We can help you add class and style to your home with beautiful new countertops.